Saturday in Ohrid began with sun and no wind but with ominous clouds threatening above. 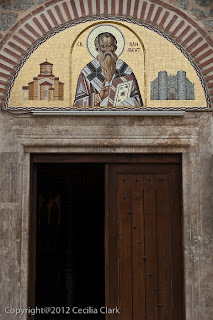 We continued our walking tour of the old city seeing more noteworthy churches. Most of the noteworthy churches for which visitors must pay an admission fee, feel cold and unused. They are more like museums. We visited St. Sophia a cathedral built in the 11th century. During the Ottoman Empire, the church was converted into a mosque and then it became a warehouse. In 1912 it was returned to it's status as a church. 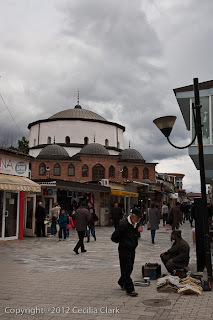 In making it into a mosque the 11th-century frescos were covered with whitewash. In the 20th century, the whitewash was carefully removed and the rare 11th-century frescos uncovered. The interior is cavernous, austere, and cold. Besides the church we went to on Good Friday evening, our favorite church was Sv. Jovan Kaneo. 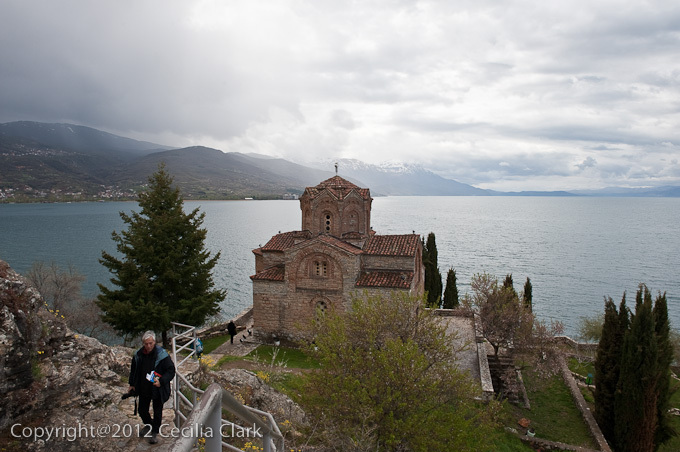 The 13th C church sits on a rocky outcropping high above the lake. We took photos from every angle and just enjoyed being there. The sun was mostly out and the sky was fabulously photogenic. 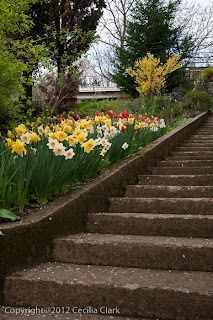 The cliffside was covered with wildflowers and blooming mustard and two white swans swam by the churches coastline. It was like a fairy tale. 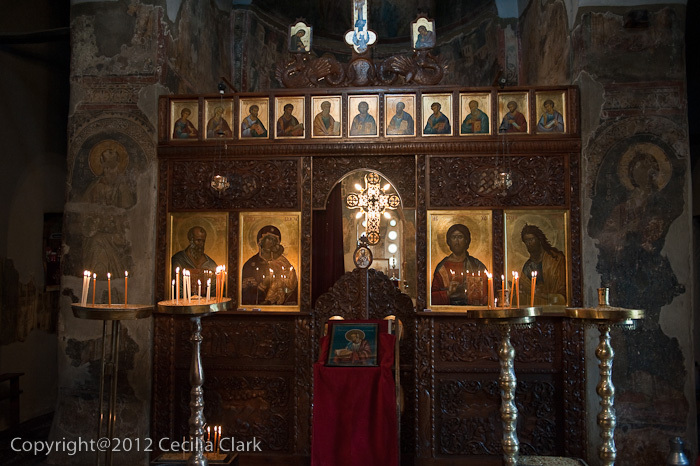 Finally, we went inside the church. I gave the church custodian a 1000 MKD bill for our 100 MKD each admission. 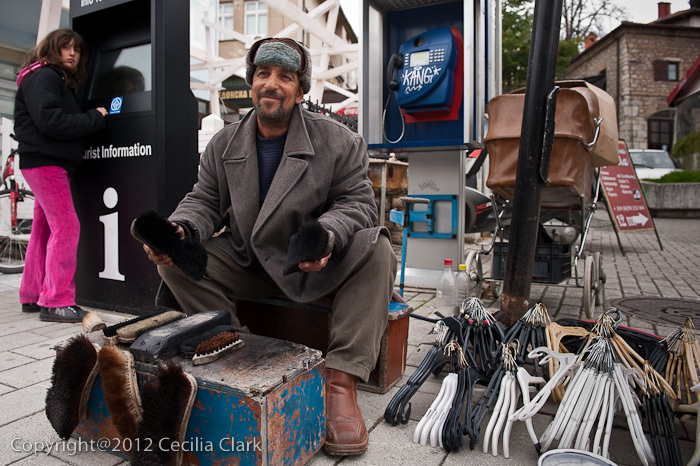 He gave me 700 MKD in change because that was all he had. To make up for the short, he offered us candles, and he gave us a tour in French of the small interior. Strangely, that while I'm not able to speak French, I can understand it pretty well. 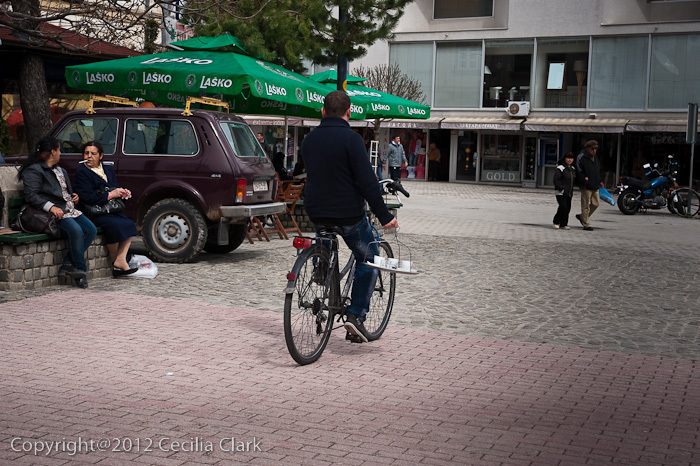 At the end of the tour, he gave both of us a small glass of rakija. Our next stop was the museum housed in the 19th-century Robev house. 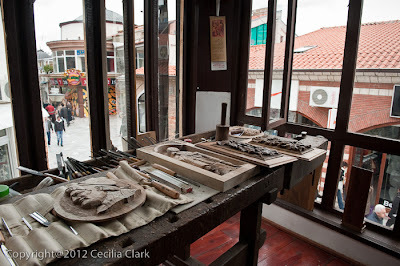 The collection isn't very interesting, but the house is a beautiful example of 19th-century Macedonia architecture. The three-story wooden structure has been well renovated. The house, actually two houses side by side, was built by two brothers. Each brother hired a different master builder and forbade the masters to confer with each other. The original structure was divided into two houses by a center wall. The third floor was not divided and both families shared this room. 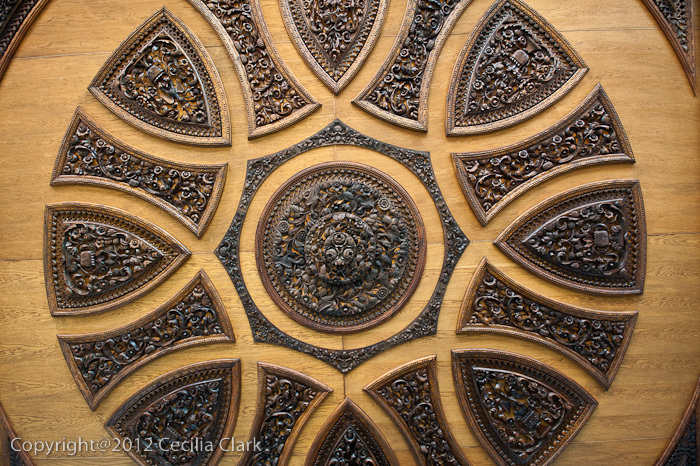 The ceiling of the third floor is embellished with a wood-carving in the shape of a medallion. 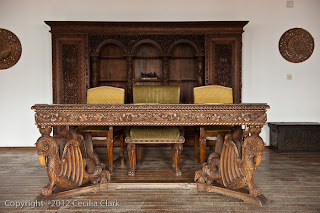 The furnishings in the room are original and were also carved by master carvers in Ohrid. 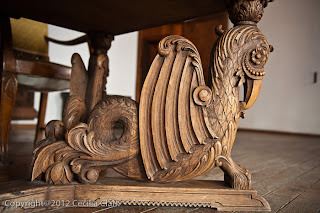 Some of the shops in the new town sell decorative wood carvings, but we didn't see any pieces that compare to the skill of the 19th-century artisans who made the furnishings in the Robev house museum. 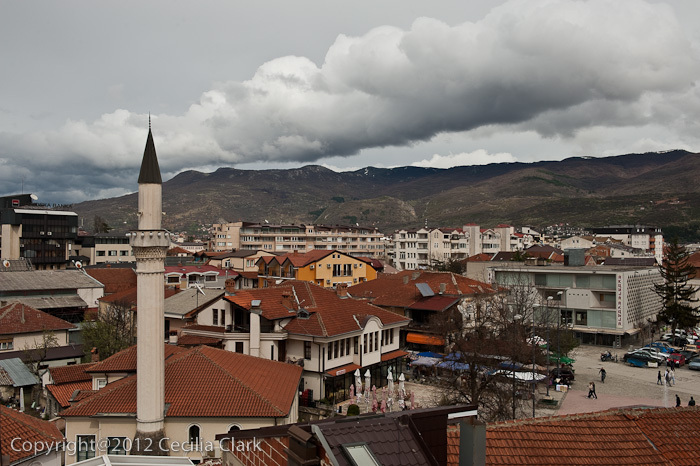 The Muslim (Turkish and/or Albanian) neighborhood is at the far end of the Tourist Street. A few mosques and the outdoor market are in this neighborhood. 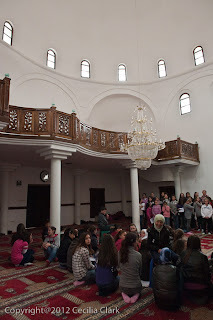 Our guidebook didn't provide any details about the mosques so we picked an interesting looking one (Ali Pasha's Mosque) to enter. The structure is a round shape dome with a rather austere interior. A group of kids were practicing music and singing inside during our visit. 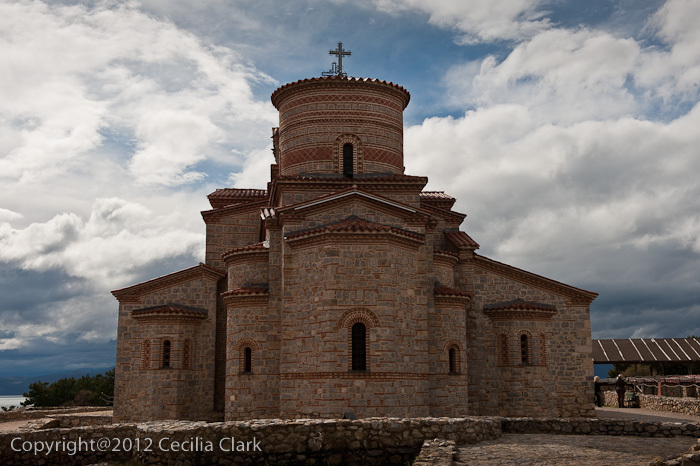 Our last church of the day was the renovated and heavily modified St. Kliment at Plaošnik. 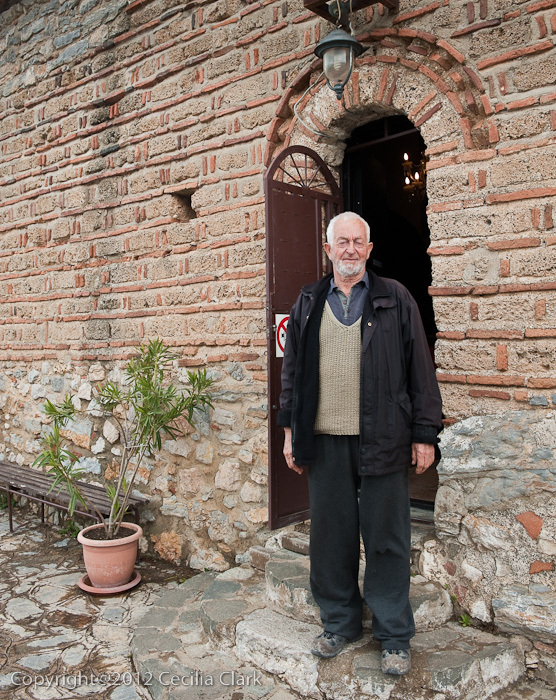 The renovation was completed in 2002 and the church is located next to the site of Kliment's monastery school from AD893. 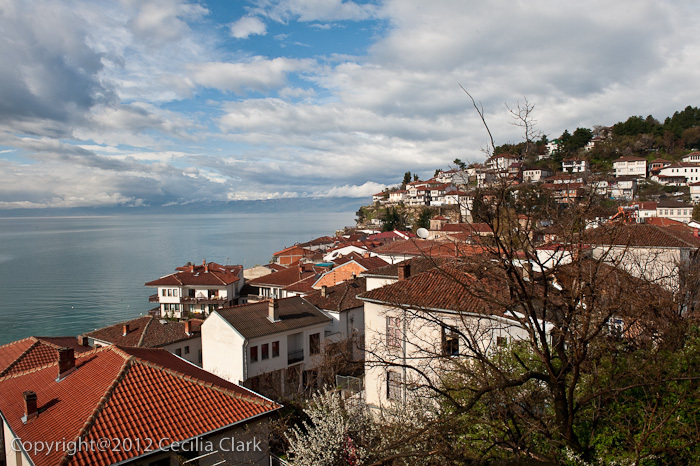 Kliment or Clement is the patron saint of Ohrid. 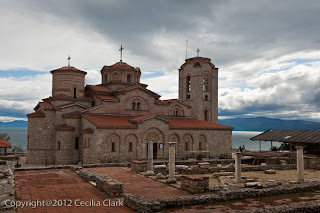 He arrived in Ohrid in the 9th century. 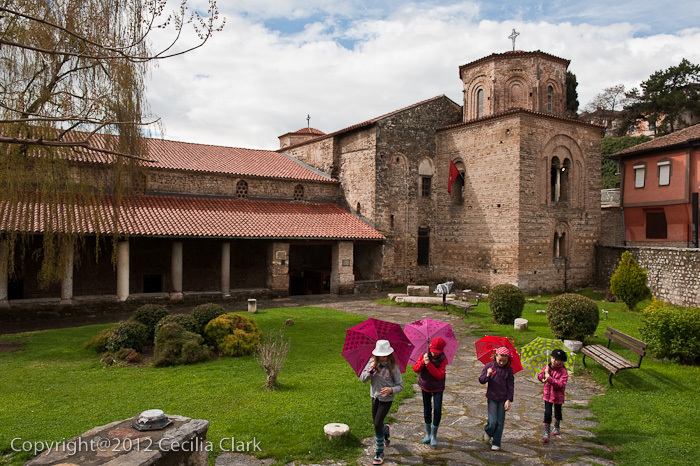 The site chosen by Kliment for his monastery school/church was the site of a 5th century church. 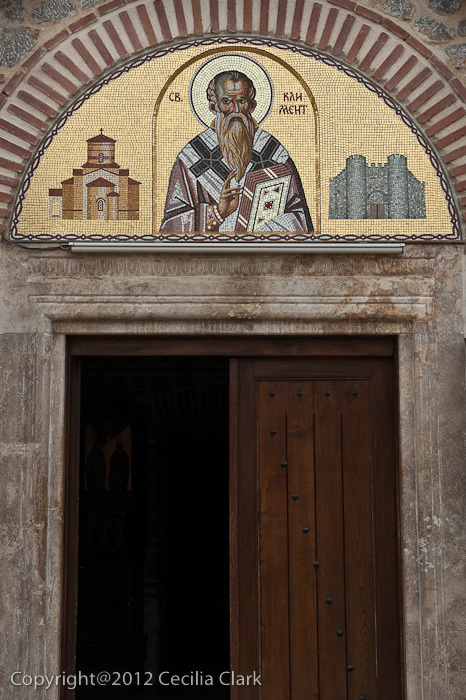 Kliment's monastery classes were taught in Slavic. The area around the current church is the site of an extensive archaeological dig. This church also commands a beautiful view of the lake. 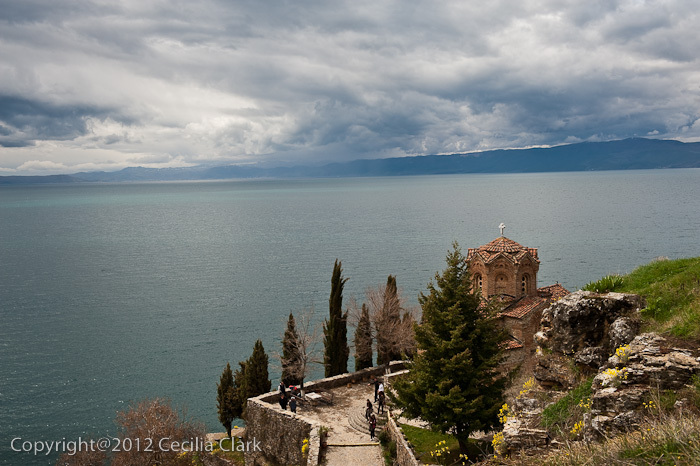 A century after Kliment, Tsar Samoil moved the capital of his empire to Ohrid. 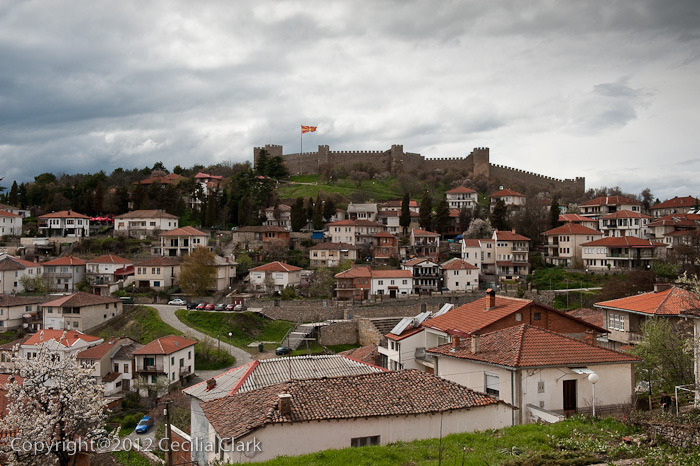 His fortress remains high above the old city of Ohrid.